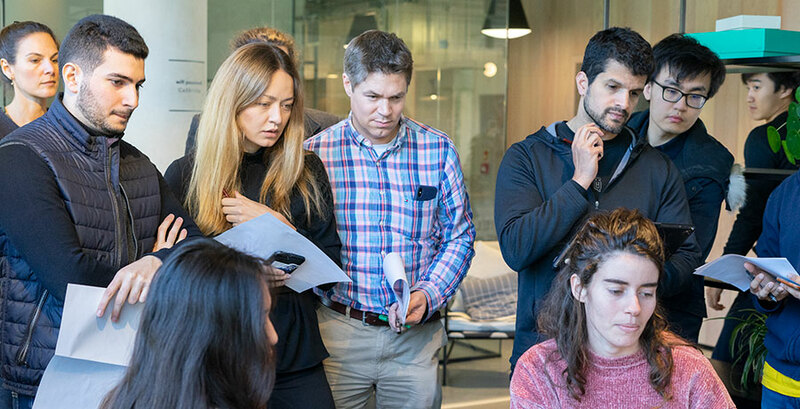 Innovation, speed, and collaboration - that’s what a hackathon is made of. Late last month, we were so excited to see students from Cambridge, Oxford, UCL, LSE, and other top universities across the UK gather together at the Cambridge Science Park. Why? To come up with innovative uses for distributed ledger technology. Some even integrated with our API to compete for the special Luno prize. The theme was the application of distributed ledger (or blockchain) technology to solve real-world problems. It was their mini-mission to upgrade the world. There was a cool BTC 4.73702 (GBP 14,300) in cash prizes up for grabs, plus food trucks, swag, fun activities, and hands-on tech workshops. 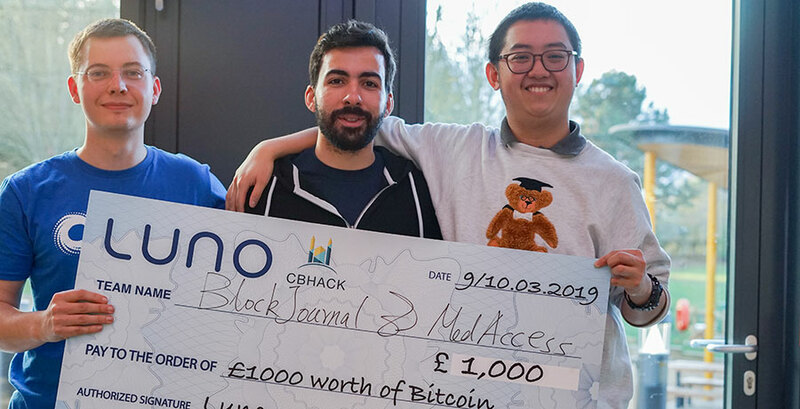 Also included was a prize of BTC 0.33126 (GBP 1,000) for the best hack to integrate our Luno API. It was a tough choice with such well thought out and crafted hacks, but our panel of judges put each project to a rigorous test. From our Luno team, Filipe, Maria, and Magdalena assisted the hackathon teams with technical assistance on their projects, brought some Luno swag, and a giant cheque. (If you want to get in on the swag, ask us a crypto-related question by tweeting us with the hashtag #AskLuno). Who are these team members? Well, Maria and Magdalena are from our European team, helping to bring our mission of upgrading the world to a better financial system to more people around the globe. While Filipe is an open source and Functional Programming enthusiast with 6+ experience in software development working on our code from ideation to production. But, let’s get down to the hacking! Imagine a world where you don’t have to worry about losing your prescription or keeping your past prescription records in a paper folder (like some kind of sensitive information caveperson Rolodex). That’s the future the students behind MedAccess envision. They sought to solve the drug epidemic by using blockchain technology to create immutable digital records for prescriptions. This way, the patient can give a doctor access to their prescription records, and the chances of false or forged prescriptions are eliminated. The team received a BTC 0.99378 (GBP 3,000) prize as well as the TODAQ sponsor challenge prize. 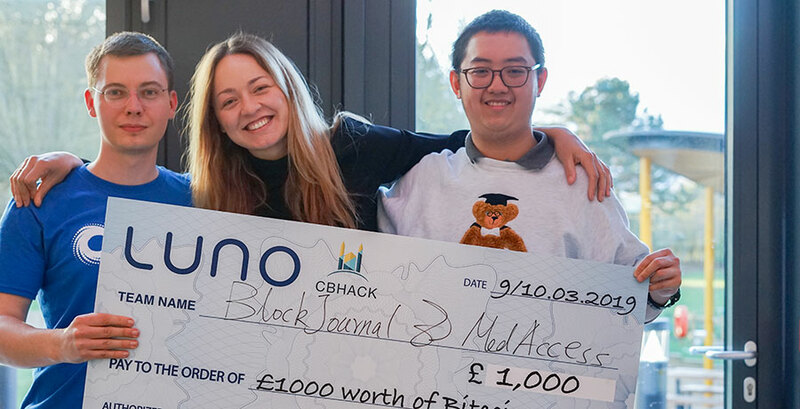 Our very own Luno Challenge winner, BlocJournal, got BTC 0.33126 (GBP 1,000) worth of Bitcoin to help journalists decentralise their stories. 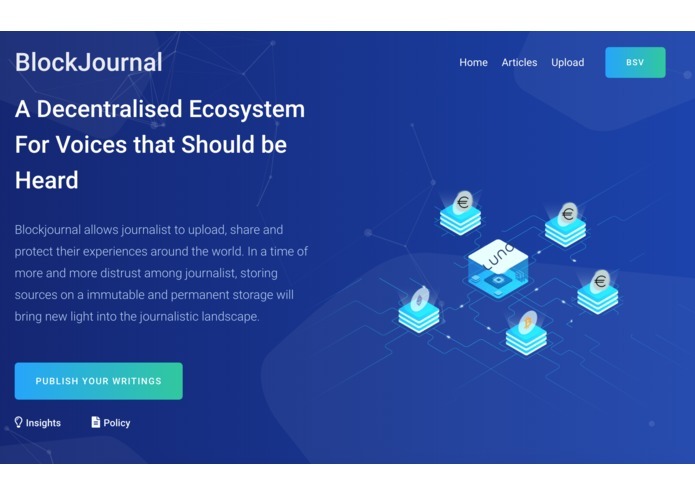 The journalists can upload their texts to the blockchain in Bitcoin Satoshi Vision (BSV) at a low cost. Then, they can share their work for free or for a fee, and receive Bitcoin or Ethereum through the Luno App. It’s a great example of how blockchain technology can get us closer to the future, today. In a time when the world is dealing with censorship, data privacy and accessibility issues, this permanent data depository is an evolution we can get behind. Team Block Scholes delved into the possibilities of the Ethereum blockchain’s finance side of things. Their hack used smart contracts to manage the life cycle of an option contract for ETH including custody and distribution of payouts. It’s the beginning of a whole new world for open finance applications, derivatives markets, and futures on the Ethereum blockchain. There were 17 teams in total, and they all put a lot of effort into their apps. Although we can’t feature them all, you can check out their awesome submissions on the CBHACK site. If that isn’t enough hackathon for you don’t worry. 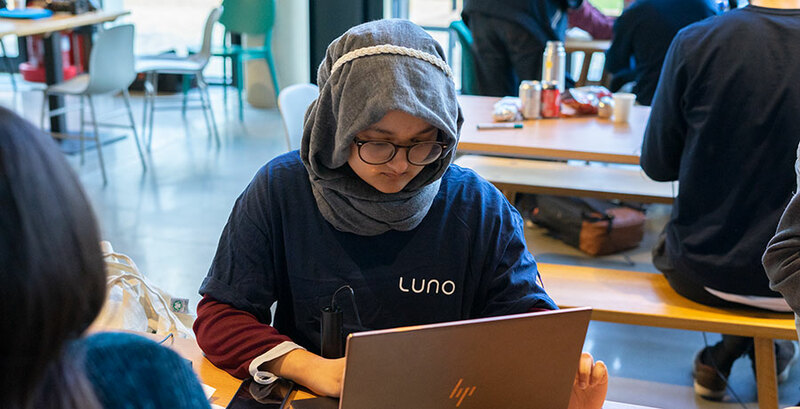 We also have a write-up on our own internal Luno Hackathon. Check out how our decentralised team built some cool apps and made our snackathon (not a typo) a blast. 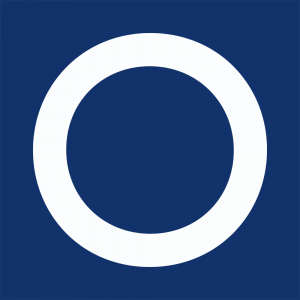 If you’re interested in working with distributed ledger technology and know a thing or two about changing the world, why don’t you check out our careers page? We’re a leading global team spread out across Africa, Europe, and Southeast Asia looking for big thinkers to join us on our mission to upgrade the world to a better financial system.